Two-part, high-build epoxy primer and barrier coat for gelcoat blister prevention and repair. Compatible with all antifouling paints, this universal primer may be used above and below the waterline. It also provides superior corrosion protection on underwater metals. Bonus: Each Gallon order includes a paint roller frame, 3/8 in. nap solvent-safe roller cover, metal tray, 10-in. stir stick, XL paint suit, 2-in. chip brush, a Scotch-Brite™ pad, 1 roll of 1-in. painter’s tape, & a pair of large latex gloves. Each Quart order includes 2-in. chip brush, 10-in. stir stick, and a pair of large latex gloves. A barrier coat seals a fiberglass hull, blocking water entry and inhibiting blister formation in underwater gelcoat and fiberglass. 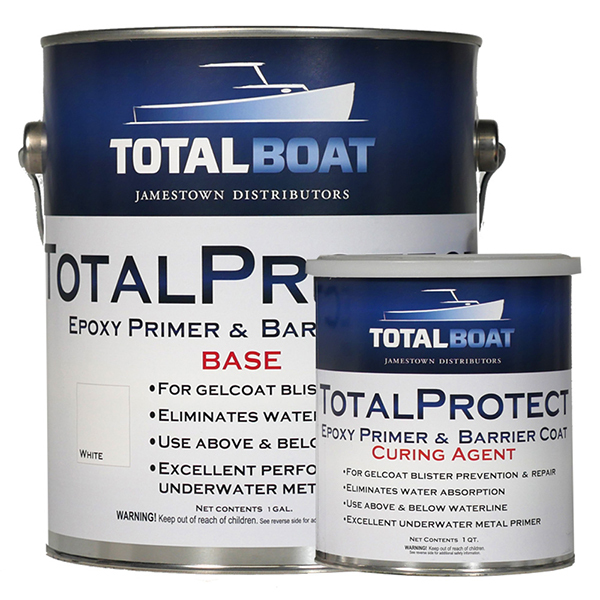 If your boat has a fiberglass hull, you should protect it with a barrier coat beneath your bottom paint. 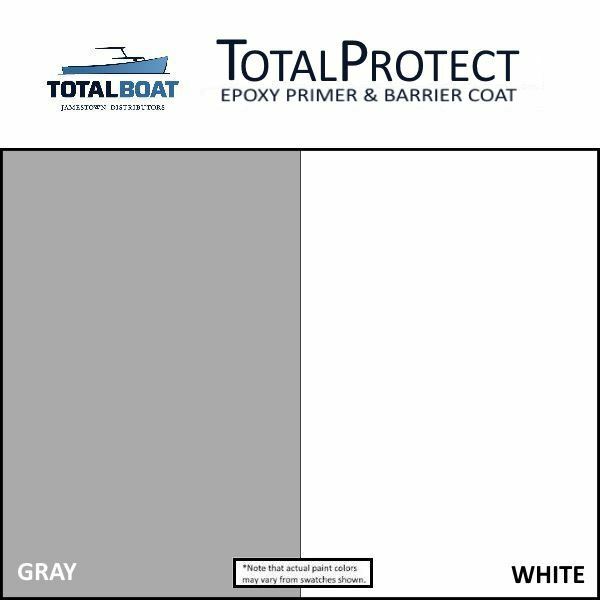 Just 10 mils (about 4 to 5 coats) of TotalProtect is all it takes to establish an aggressive barrier coat. Water can’t get in to do damage. TotalProtect is also flexible and can take the tough pounding and movement a hull undergoes without cracking or lifting. When we say TotalProtect is a “universal” primer, we mean it. Besides being an effective, impermeable barrier coating on fiberglass hulls, TotalProtect has great adhesion and corrosion-protection benefits as an epoxy primer on all metal substrates. Use one, two, or three coats depending on your application. It blankets the metal so oxygen can’t reach it and corrosion can’t start — either above the waterline or underwater. To prevent waste, mix whatever amount of TotalProtect you think you can use before it kicks, which is 5 hours —a long time compared to competing brands. It’s easy to mix and use, but if you’re new at this, you may want to start with a test batch to hone your technique. Three parts base with one part curing agent in a paint pot will do it. For example, use a graduated cup to measure 12 ounces of base to 4 ounces of hardener. Mix well. Accurate measuring is easy to do, and it’s important because with smaller amounts of base and curing agent, slight deviations in the mix ratio are greatly magnified. It’s just something to be aware, rather than afraid of. Otherwise it’s easy to mix the entire batch at once. Just dump the curing agent into the can of base. We made sure there’s enough room in there. No need to grab a separate container for mixing. Timing is everything when applying antifouling bottom paint over TotalProtect. Once you’ve laid down the final coat of TotalProtect, the right time to overcoat with antifouling paint is when the surface is thumbprint tacky. That means your thumbprint is visible on the surface, but there’s no epoxy stuck to your thumb. If there’s epoxy on your thumb, it’s too soon. If you can’t see your thumbprint on the surface at all, you’ve missed the overcoat window and need to sand with 80-grit paper or apply another coat of TotalProtect. Wait for thumbprint tackiness, then overcoat with antifouling. Also use the thumbprint tacky test for recoating TotalProtect on itself. At 3 to 48 hours, TotalProtect gives you more time between coats as you’re building up the barrier coating. After 48 hours, sand with 80-grit paper to make the surface toothy enough for the next coat. TotalProtect will fill in tiny scratches due to its high-build capabilities, but it’s not a filler. For scratches, dings, and dents 1⁄16” deep or greater, use TotalFair epoxy fairing putty first, then sand smooth and overcoat. Wear protective gloves, clothing protection, eye/face protection, and a proper respirator when applying or sanding TotalBoat TotalProtect.